Our beaches are protected by offshore reefs that create the calmest waters for leisure swims. Every Sandals sits directly on a stunning beach on six of the most gorgeous destinations in the Caribbean, a region famous for its endless white-sand expanses, exquisite turquoise waters and romantic sunsets. From Jamaica’s warm reggae pulse to the Bahamas’ sophisticated beat and from Saint Lucia’s volcanic majesty to Antigua’s exotic allure. Sandals exclusive "Stay at One, Play at All" exchange programme means you can stay at one Sandals Resort and enjoy the amenities, services, bars and restaurants at all other Sandals Resorts for the duration of your getaway. We’ll even include roundtrip transfers between nearby resorts. We have thought of everything to make your accommodations a luxurious retreat perfect for couples in love. From spectacular Over-the-Water Villas and dramatic cliffside suites with 180-degree views to lavish Skypool Butler Suites with infinity-edge plunge pools and unique Rondoval Suites, Sandals Signature Accommodations are sure to elevate your romance to new heights. A place with extraordinary privileges and exceptional service. Club Sandals offers unique insider’s opportunities exclusive to concierge guests and the best recommendations for discovering all that Sandals has to offer. Sandals Love Nest Suites® are unlike any other accommodations ever created. Coined the most romantic suites in the Caribbean, this exceptional collection offers the utmost in privacy, comfort and five-star luxury. At Sandals, dining is one of the most impressive highlights of your luxury all-inclusive holiday. With over 70 unique restaurants from around the world and as many as 21 unique culinary concepts, you’ll enjoy a level of variety, quality and creativity that’s simply unmatched by other all-inclusive resorts. At Sandals all-inclusive resorts you enjoy 24-hour drink availability! Our bars are open from early in the morning until late at night. All our rooms are stocked daily with beer and wine, plus our Club and Butler suites include premium spirits. We have designed the bars exactly where they should be - right on the beach and directly over the ocean - to give you a truly authentic island experience. Only Sandals includes diving with the best in equipment, staff and unbelievable dive sites. Even if you’ve never dived before, our PADI® Discover Scuba Diving Programme (nominal fee applies) will have you experiencing a whole new underwater world by the very next day – with all the instruction and equipment you need. Every Sandals Resort offers access to a selection of spectacular dive spots featuring vivid marine life, thriving coral reefs and exciting and unique sights. Every water sport imaginable is included along with top-of-the-line equipment and instruction. Only Sandals includes a full range of motorised water sports*. *Price includes 2 free dives per day. *Motorised water sports may not be available at all locations. *Activities and amenities vary by resort. Whether it’s one of our new high-energy group classes, a personalised training session, or a solo workout, you will be sure to find the fun in fitness! Sandals includes top-of-the-line Life Fitness weight and cardio equipment, a variety of fitness classes and professional instruction. Lovers Lanes, Sandals first 4-lane bowling alley, features a colourful backdrop for a romantic evening of couples bowling. * The New 4-lane Lovers Lanes bowling alley is only available at Sandals Royal Barbados. 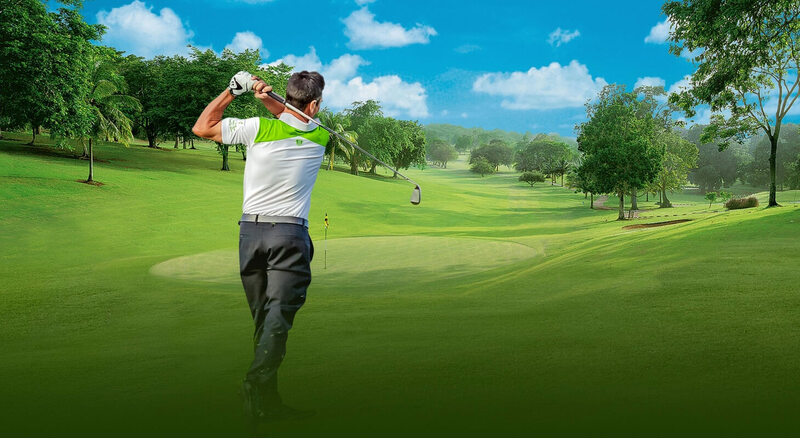 Enjoy golf with complimentary green fees* at any of our all-inclusive golf resorts in Jamaica, Saint Lucia and the Bahamas. Our golf courses are perfect for every skill level. Best of all, free round-trip transfers are included from all our nearby Sandals Resorts. Our Bahamas golf course, Sandals Emerald Bay Golf Course, stretches 7,001 yards in length and has been named one of the best courses in the Caribbean by Travel + Leisure Golf. Enjoy two golf courses in Saint Lucia - the 9-hole Sandals Golf Club and the 18-hole Sandals St. Lucia Golf & Country Club at Cap Estate. These challenging fairways are perfect for beginners and masters alike. *Unlimited play is included for all guests in Jamaica and St. Lucia. Unlimited play at Sandals Emerald Bay is included for butler-level guests only. All other guests can play 2 rounds free as part of current "2 Rounds Free" offer which is subject to change at any time. Golf not included in Antigua, Barbados, and Grenada. A mere sea breeze away is Sandals Island, Sandals Royal Caribbean’s own private offshore island. Engage in a seductive rendezvous on an ever-so-secluded private beach. Minutes offshore by our own private ferry or kayak, Sandals Island at Sandals Royal Bahamian is an exotic island adventure where you can escape for a couple of hours or for the whole day. With Sandals Offshore Islands you get two all-inclusive holidays for the price of one. Located at Sandals Royal Caribbean and Sandals Royal Bahamian just minutes from the main resort. Relish the cool tranquillity of Sandals dazzling pools. Steal away moments of quiet togetherness amidst the serenity of a free-form lagoon pool, enjoy the energy of our signature swim-up pool bars, or experience the elegance of our zero-entry pools that are the heartbeat of our resorts. Each of our pools have a unique personality and many of them are just steps from the sea. At Sandals, we understand that your love story is unique and special… and your wedding should be, too. That’s why we’ve replaced wedding packages with wedding planners, making a very personal experience a personalised one for you. We’ve added all the extras to make your special day even more extraordinary. So tell us your dream, and we’ll bring it to life. Welcome to Sandals, where the bellman greets you by name, the bartender remembers your favourite drink, and every smile makes you feel at home. Our staff is the finest in the Caribbean, embracing a philosophy of unrivaled personalised service that is the hallmark Sandals success. Experience the pinnacle of personalised service at Sandals Resorts and enjoy our industry-leading, uncompromising standard of hospitality every waking moment of your stay. Great opportunities are available for Sandals staff members through Sandals Corporate University with the best education and training programmes. Surround yourself with timeless elegance and refined style before you even reach your Luxury Included® destination with our Exclusive Airport Arrival Lounge in Jamaica. Relax and enjoy your stress-free direct roundtrip airport transfers. Or opt to arrive in style in a luxurious vehicle from our fleet with a first class, private luxury transfer, which is available for an additional cost. Enjoy internet access throughout your holiday from any device anywhere on the resort including any room category with FREE All-Luxury Included Connections. Sandals offers guests certain services and amenities for an additional cost, such as the Caribbean-inspired treatments at Red Lane® Spa, optional tours at Island Routes, romantic private candlelight dinners for two, Scuba certification courses, and much more. Red Lane® Spa reinterpret classic European rituals with distinctive Caribbean flair. Experience serene indoor sanctuaries or exotic outdoor settings. Indulge in limited-edition events and experiences centred around six distinct areas: music, culture, sports, culinary, voluntourism and social interest. To be the very best requires creativity, commitment, and constant innovation - all things we do very well at Sandals. We’re proud to have been showered with some of the most prestigious awards and accolades.